Have you ever wanted to schedule a text a message to be sent out later? If so, give the Scheduler in MightyText a try! You can schedule messages from your computer or tablet, and they will be sent out by your phone at the scheduled time. 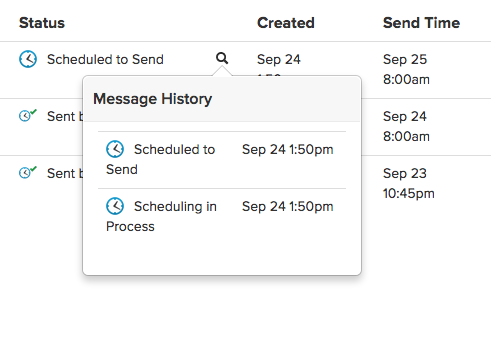 Scheduled messages can be quickly created in a New Message, in reply to an existing message thread, or from a Quick Reply window. To schedule a message, click the Schedule icon below the text response area. Next, choose the date and time for your message to be sent out by your phone. Finally, enter the message text and click Schedule. You can see a list of your past scheduled messages and future scheduled messages in the Scheduler pane in the MightyText Web App, Tablet App, or Phone app. Click on the magnifying glass in the Scheduler pane to see details about the scheduled message. To cancel a pending scheduled message, you can locate the message in your threads and click on the X icon to the left side of the message bubble. If you're not at your computer, you can also cancel scheduled messages in the MightyText Android phone app. Just open the MightyText Android phone app and tap on the triple dot settings icon. In the settings list, tap Scheduler. If you long press on a scheduled message, the Cancel option will appear. Tap "Cancel" and you’re all set! Once Scheduled messages are canceled, sent successfully, or have failed to send, they can be deleted in MightyText message threads. When you hover over a message, a trash icon appears.